Just over 12 months ago she was playing (against us) at Herts Sevens, but in a few weeks time Hannah Field (ex-Reading, now London Wasps) will be playing for the full England Sevens team in the European Championships in Moscow. She will be joined there by fellow England U20 player Rosie Fong of Darlington. The two players are the latest example of the growing impact teenage players are beginning to have on the senior game - often within months of becoming seniors - as the growth in the size and quality of junior rugby, which began around six or seven years ago, begins to have an impact. Even ten years ago the junior game was very small indeed. Regions were begun as a means of bringing enough players together to play a 15-a-side game - very, very few clubs could field anything close to a full side. 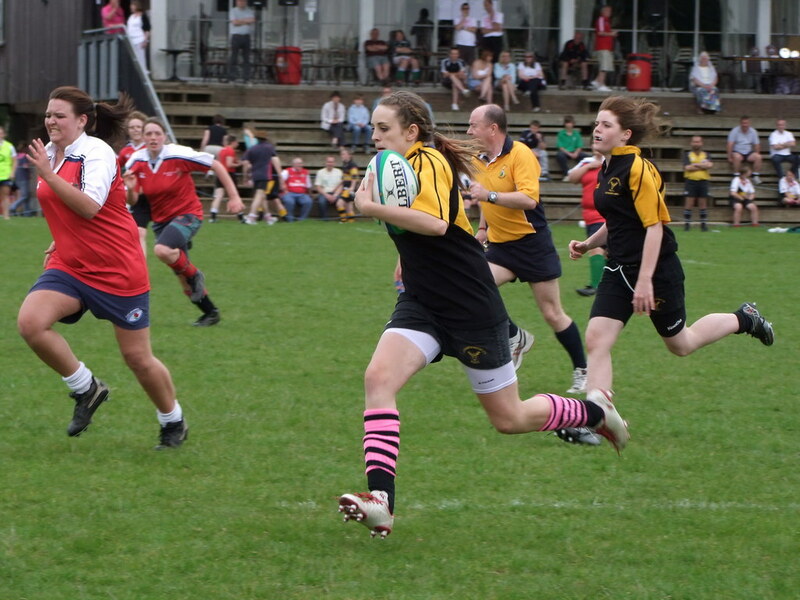 Many - even most - women rugby players did not start playing the game until they went to university. But today that is all changing. England teams are becoming younger and the future England team will be playing U15 - even U12 - rugby next season. Apparently they are very keen on finding and helping to develop other teams in the South East (as they invariably travel to Nottingham or beyond). Strange way to show it. Which leaves us with a few options for the future of a "Legends reunited" day. Do we give the RL another chance - either in two weeks or four (when the next two festivals are planned), or try to enter a Sevens some time somewhere, or... well, ideas anyone? Thanks to everyone who turned up, and to Chloe, Sasha and Jess in particular for all the hard work they put in. Sorry it did not come to anything. More women's rugby success with the news that Hitchin have also been promoted, after so narrowly missing out last year. Again this is a bit late as news goes, and unfortunately the disappearance of all of last season's women's results from the RFU's results database makes it a shade difficult (well, impossible in fact) to keep track of what went on last season. However Rachel tells me that Hitchin now join fellow Herts teams Hertford, Tabard and Old Albanians II (plus Harlow, Wellingborough and Southwold) in South East (North) 2 next season - which promises to be a league full of fascinating local rivalries, not to mention shorter journeys. There are three pitches available and it would be appreciated if teams could get changed into their gear as quickly as possible as there are two change rooms. Despite Wimbledon taking place at the moment, the forecasters says it will be a shiny day, so let’s hope they are right. I have been told that some teams may not have any subs, we will arrange before each kick off the number of players we will have on the pitch for each individual game. From our perspective, the first round is about getting as many players receiving as much playing time as they like. The day will run in a round robin format, and depending on the number of confirmed teams, a final game between the top two placed teams. Registration forms will be present on the day, and I ask that each team manager arranges for these to be filled out by all players for insurance purposes. Finally, if your team has not confirmed already, please let me know if you are expecting to take part this Saturday or not. The next round is only two weeks away and I am sure you will have a great time and want to join us in South London on the 10th June. Any further questions, don’t hesitate to get in touch. Phone calls will work best over the next few days. County rugby 2010/11... is that it? As well as taking over club leagues, RFUW have also taken over control of inter-county rugby. Which is a good thing - the management of representative rugby should be what a national body does, just as the RFU control inter-county men's rugby. They have just issued the county fixtures for next season and another good thing is that the first fixture - which sees Hertfordshire away to Leicestershire - will bring together in one place, and for the first time, the U15s, U18s and adult county teams. As a result it will see both current and former county juniors together - should be a great day out! Indeed anything that brings the senior and juniors together must be applauded as it will help keep juniors in the game after 18. The next game will see the adults hosting Notts, Lincs & Derby, while the juniors travel to Eastern Counties to play in a triangular which will also involve Kent. And that seems to be it. Yes - the entire county season, that used to see the seniors play at least three or four games in a South East League, and the juniors take part in two or three festivals as well as a couple of friendlies in a programme that ran from September to December, has - as a result of RFUW's take over - been reduced to a couple of random games in November and December. In short you are - yet again - forced to wonder what the heck RFUW are playing at. I know that in Herts we have been spoilt because our county and club programmes have been so well organised and managed (the promotion of OA Saints to join Saracens in the adult premiership is really no fluke), but why should we have to go backwards? What is to be gained by aiming for the lowest common denominator? ... the RFUW's unstoppable charge towards junior leagues continues. Several teams have withdrawn - including ourselves, Saracens, Leeds, Sleaford and others - but others have joined (apparently) - in total defiance of the RFUW's own closing date for entries! This has resulted in a rejigging of leagues, including the abolition of the U15 South West North league, which means that quite a few teams now have U15 and U18 teams in different leagues, which will make parents and coaches very happy and clearly shows some jaw dropping ignorance about how junior rugby works. In addition some leagues now have 10 teams, while others only have four. This means that for teams in these big leagues they will now have to set aside most of their club dates to the league - which means that they must hope and pray that the other teams in their leagues will all turn up, otherwise there will be a lot of blank dates to fill at probably very short notice. After all, much as we would prefer it not to be the case, the fact is that on average around 15-20% of teams disappear each season. The good news is that these tend to be balanced with a similar number of new teams that appear during the season... but they obviously will not be in the leagues! "there is no other way and the aim is to get girls playing rugby"
Its just that RFUW have not considered any of them! As for "getting girls playing rugby", its a nice thing to say but (based on their actions) it has never been RFUW's overriding aim up until now. It has been aim of the hundreds of volunteers in junior rugby, all of whom must be a little peeved by the implication that they were not doing it properly. However truth is that the inevitable formality, straight-jacket structure, and rules of a league will prevent girls from playing. First, the new clubs forming (mentioned above) will find it very hard to get fixtures, especially in areas where all the existing clubs are in leagues, so may never get off the ground. Triangular fixtures and the ad-hoc lending of players to make up teams (as typified by the brilliantly successful South West model) will be impossible. Think back to our many, many three-way afternoons - games like that with Bedford and Ampthill last year where we they combined together to play us at U18, while we combined with Ampthill to play Bedford at U15. Worked wonderfully - cannot happen in leagues as players obviously cannot play for other clubs. Or another example. In the past if a club with 15 players rolled up at club that has only 7 one club would often have lent the other players to make up an 11-a-side game. We've done this dozens of times - who can forget Hayley Gulder playing scrumhalf for Ampthill, or Nikki Alcock's try-saving tackle on her sister, or the fact in our very first game the points scored against us were actually scored by Letchworth players! It cannot happen in a league - so in these circumstances eight girls will NOT be playing. They'll be kicking their heels on the touchline. Short for a game? Forget ringing up another club to borrow a couple of spare players. And forget player-sharing arrangements like we have had with several girls, like Sasha. Problems with your club - want to move? You're going to find it very hard to do that mid-season. And so on. In these ways - and more - formal leagues will inevitably result in fewer playing opportunities, frustrating the formation of new teams, presenting extra barriers to the selection of new players, killing off inter-club co-operation. The only reason there may be "no other way" in 2010/11 is simply because RFUW have listened to no-one and have killed off every other alternative! World Cup: Next time its for real! The sparing and testing is now over - the next time any players from the 12 qualifiers for the World Cup pull on a national shirt "in anger" it will be for the World Cup itself. USA and Canada finished off what has been the most intensive period of pre-tournament internationals in the history of the Women's World Cup. With the notable exception of Australia, every qualifier has been on tour or have played in a major tournament in the last year. The game took place at 1am our time at the exotically named Bear Mountain Stadium in British Columbia, where Canada and USA (WRWC 4th and 5th seeds) met for the 27th time on what looks like an artificial pitch (has any rugby international been played on a plastic pitch before, I wonder?). Canada came out 34-22 winners, thanks to an electric start - scoring in the first two minutes - and maintaining a comfortable lead throughout. With that they took the series 2-0, returning their World Cup campaign to the right direction after they appeared to be heading the wrong way after the Nations Cup last summer. For the USA there is more to work on - not least, perhaps, confidence having now lost three out of four this year against their local rivals. There are a few largely behind-closed-doors training games planned - England are due to meet Wales a couple of times, and Scotland will be playing both Ireland and Wales - but other than that its going to be back to the training and conditioning camps for everyone until the big kick-off on 20th August. There's an interesting article about Heather Moyes - Canada's bobsleigh hero, now returning to international rugby - here, saying how much the standard of rugby has improved in the two years she has been away. A word of congratulations (if a week or two late, as I only just found out) to the OA Saints team who have been promoted to the RFUW's Premiership - the highest league for women's teams - which means that they will join teams like Saracens, Richmond, Northumbria etc. at the top of the women's club rugby pyramid. Their elevation is all the more remarkable because no-one was suppose to be promoted or relegated this season, due to the World Cup taking away so many players from the top clubs. However, after they had won the Southern Championship and then the North/South play-off, one of the existing Premiership teams pulled out of next season's league, and so OAs were invited to take their place. There are only about a dozen teams in the Premiership, so to have two from Hertfordshire (or - to be pedantic - just over the border in Saracen's case) is pretty amazing. The games between Saracens and OAs also promise to be lively affairs next season, bringing together and reuniting some significant personal rivalries from junior rugby days. A remarkable little story from Land of the Long White Cloud - and maybe a small clue as to why the New Zealanders are so good at the game. 1. This was Southlands Girls 1st XV, which kind of implies that they have a 2nd, and maybe even 3rd XV, as well. This is pretty impressive for a school roughly the same size as Hitchin Girls'! 2. They clearly have no concept of mercy in Kiwi rugby - no truck with concepts such as calling a game off when one team is 50 points ahead. On the contrary, in New Zealand it would seem that, once an opponent is on the floor, the main consideration is to go for the jugular and keep them there. 3. Southlands scored 22 tries - 17 of which were converted by full-back Nina Shields (left) - in a game that lasted only 45 minutes. Taking into account the time to take the kicks, for Nina to get back into position for the next restart and so on, this would seem to mean that they scored a try every minute or so that the ball was in play! Its not that far short of the world record in a properly contested match over 80 minutes (which is somewhere around 229-0) - indeed in terms of points scored per minute it would seem to exceed it! 4. And finally the newspaper report is a straight report on the game with none of the man-bites-dog journalism that most mentions of the game in this country tend to get. In short, its difficult to imagine that anything like this would ever happen here! "Legends reunited" - now is the hour to step forward! So - now is the time when firm commitments are needed (or as firm as possible with just under two weeks to go). If you can play (or hope to play), or have managed to get any friends to play, please let me know as soon as possible. We need at least nine names - ideally more than that. If we can pull this off then we can look forward to other reunions in the future - not only other RL festivals, but perhaps entering a sevens next summer, or organising a friendly game against a local club (like Hitchin, perhaps) next season - so please try to spare a few hours on a Saturday afternoon. It should be worth it! Remember - anyone in the current U18 team can play, as well as former Legends!! If anyone thought that last weeks sensational win by South Africa over Scotland was a flash in the pan - a well prepared visiting team meeting a home side that had not played together since the Six Nations - then Saturday's second test put that right, with South Africa coming back from 14-7 down at half-time to win 41-17, superior fitness telling in the final quarter in particular when it seems that they ran amock (see Scrumqueens and SRU reports). Only USA and Canada - who meet in a two game series starting tomorrow (or just after midnight Tuesday, our time*) - have any full internationals left now before the big kick-off at the end of August, though all the Home Nations have arranged one or more "training games" due to take place over the next month or so. It still looks like an England v New Zealand final (though it is quite possible they could meet in a semi-final), but beyond that it could not be closer - and its the battle for 3rd-6th that will actually be the most exciting things about the tournament. USA, Canada, France, Ireland and now South Africa all have great chances of reaching the last four, as do Wales if they can recover from their Six Nations disaster and play like they did in 2009. Tickets are still available apparently - and RFUW have said that they can increase capacity at Surrey Sports Park if all the current tickets go - so if any other World Cup is boring you a bit at the minute, the good news is that something that promises to be much more interesting is getting closer every day! Its not exactly textbook, but its very effective - even against the biggest of opponents. The above tackle was hardly unique. 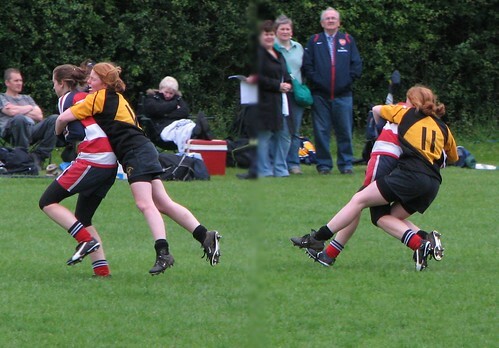 Natalie took second place in a "Tackle of the Year" in 2006-7 for this vital try saver in the final of the National Sevens (right)! What is shows is one of the great features of Natalie's play - she never gives up. Her name frequently appears on the scoresheet, but she has probably save as many tries as she has scored, chasing down "lost causes" and making remarkable one-on-one tackles, often securing the ball as well. And its not a technique that she was caught - this was all Nat's own invention. 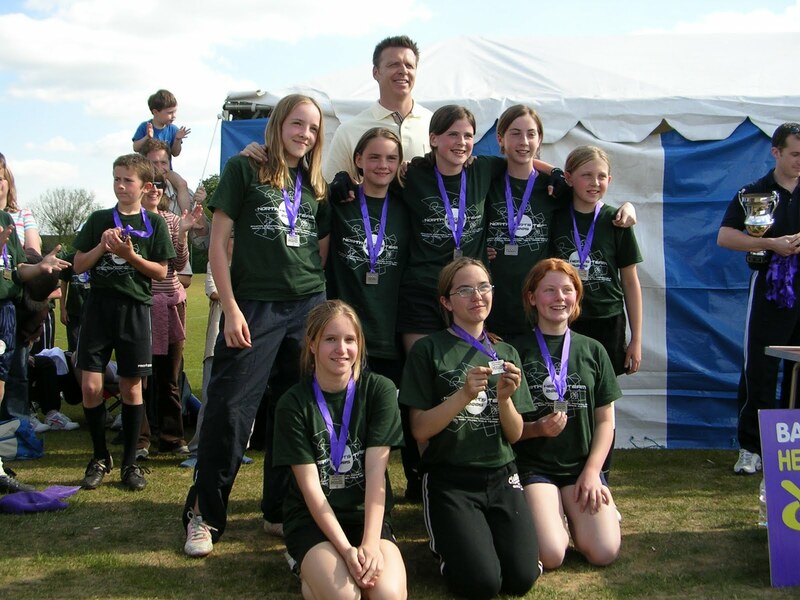 Nat was part of a talented intake of new players in our second season - but uniquely she had already started her medal collection as part of our second tag team at Herts Youth Games in 2005 - the last year that the Games included a Girls U14 competition. Lead by Nikki, the team included several experienced players - which was useful when East Herts attempted to field someone who had played for East Region, which was against the Games' rules. It was an early introduction for Natalie to the some of the less savoury aspects of the game! 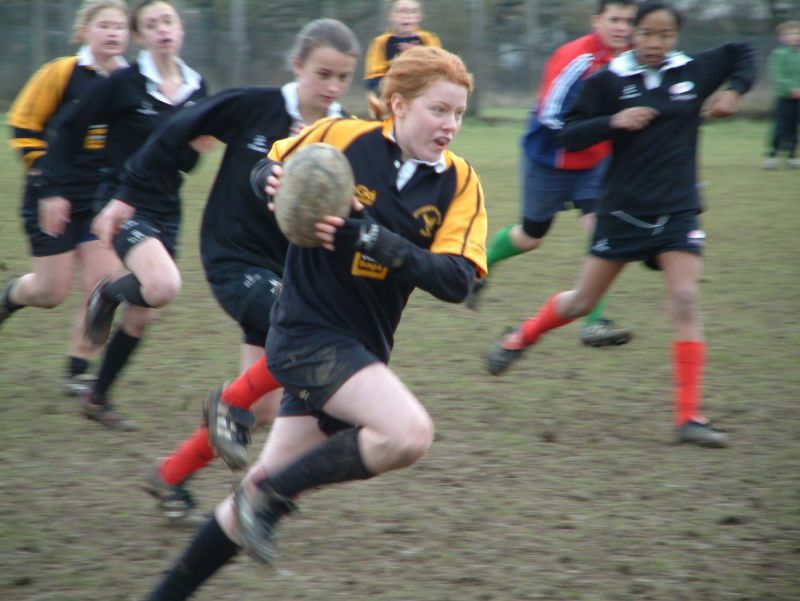 With that kick-start to her rugby career, Natalie became the star of the 2005/6 U14 team - a feared player who ran in stacks of tries, right from her first game (against Milton Keynes, left). Nat went on to play for the county and region, was chosen as the U14s Player of the Year, and even selected to join the county's summer Athlete Development Programme. Unfortunately Natalie's experience of representative rugby wasn't something she enjoyed, and it was only in past couple of years that she put herself forward again. The county and region's loss was our gain. As Natalie moved up to the next age band she became a vital part of the successful U17 team - from scoring crucial tries in the 2006 Rochford 10s win to making vital tackles in the final of the 2007 National 7s plate, Natalie was always been at the heart of the action. And so she has remained - as this slide show demonstrates! Natalie has been the ideal all round player, a match winner at both ends of the pitch, feared and respected by opponents, loved by team-mates - the fearless lioness of Letchworth Legends. Of all the many girls who have played for Letchworth in the past six years, only two who started their rugby careers at Letchworth have gone on to be picked for the RFUW's summer HPAs†. One was Hayley Guilder, and the other Jess Robinson. Yet, if you look back at reports on games played in Jess's first year at Letchworth you'd never have thought that Jess was to become one of the best players that Letchworth would ever produce. Not that Jess was ever in any way a poor player - within a few weeks of taking up the game she found her way into the county U14 squad - but its not her name that appears in match reports. Jess was fast, but it was Natalie that defences feared most in that first season as she ran off with the U14 Player of the Season. Jess, however, took "Most Improved" - which sums up what has made her a great player. Jess was always looking to improve. She was determined and really wanted to become a better player, to get into county and regional teams - and year on year she succeeded, becoming a better and better player. In Jess's second season she became part of the new U17 squad - a real "dream team" with Jess and her ex-U14s helping to turn a promising but forward-dominated squad into a superb all round team that began to rack up the medals and trophies, almost as much as Jess began to rack up the tries. Though disappointed that she missed out on county selection in her first U17 season, Jess showed that determination throughout the season - and from that "dream team" it was Jess who became Player of the Year. By the following year she was back in the county team again - and picked for regional trials. In fact the only problem Jess faced became where to play. In the U14s she was mainly a wing - she was fast, but very slim - however, as Jess grew she soon showed she could play full-back, and centre, occasionally fly-half. But if she was to make the regional teams she needed to decide where she would settle. It was Simon Shutler, when coaching the county team, who came up with the answer, and an answer again that would never have occurred to anyone who saw Jess start. Jess should become a forward. Not in the front row (though it did happen - see left! ), but as second row or flaker. Its a position that was new to Jess, but she took to it - and in 2008 she made the East Region team as a forward, and it was as a forward that she was picked for last summer's HPAs. Jess is a star - but what is brilliant about her is that she has made herself a star. Her determination and will to improve has made her the brilliant player she now is - quite simply, and based on the judgement of coaches from outside the club, one of the best players Letchworth Girls have ever had. *With deepest apologies to Simon & Garfunkel. † By all rights it should have been three this summer, but RFUW cancelled the U15 HPAs. News from Lasswade, near Edinburgh, of a remarkable international today between Scotland and South Africa. In fact, a small South African win would have been a total shock, though Scotland would have started favourites, but a win for the visitors by four tries to one is amazing. South Africa were ranked 12th when the World Cup draw was made - as a result they find themselves in New Zealand's group, and what is more open the tournament against the World Champions. However their other two opponents, Wales and Australia, will be needing to do some pretty rapid reassessments of the "weakest" team in Group A. With Australia not playing any warm-up internationals, and Wales trying to recover from a disastrous Six Nations, there could well be a surprise team finishing second - and maybe making the semi-finals? 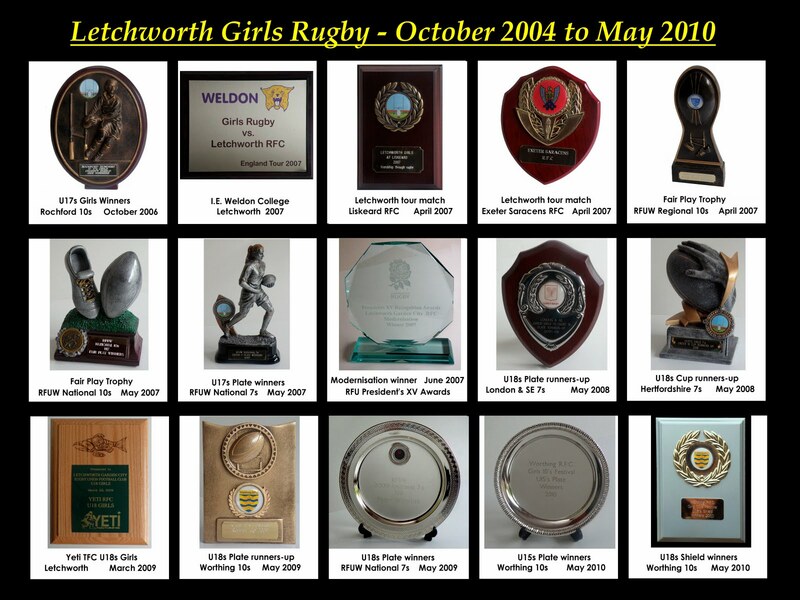 Over the 6 years that the girls' section of Letchworth rugby club has been in existance, they have collected a number of shields and plaques commemorating matches and have won a number of trophies at competitions. At first, the trophies were housed in whatever convenient nook or cranny could be found in the clubhouse but, as the number grew, it became more and more difficult to find a suitable place for new awards. Furthermore, it was not possible to view the collection properly and there was an increasing danger that some items might be lost. To preserve the collection, it was moved temporarily to a home - my home, actually - pending a proper cabinet being provided at the clubhouse. Altogether there are 15 trophies - 10 for achievements on the field and 5 commemorative pieces. 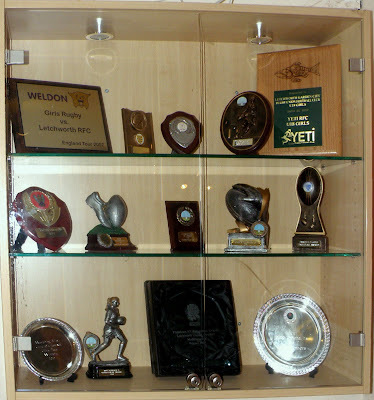 Amongst the collection are commemorative plaques from two Canadian touring sides, 'Fair Play' trophies from the Regional 10s and the National 10s, the 2006 Rochford 10s U17s trophy, the 2007 RFU President's XV award for modernisation and two U18s RFUW National 7s Plates (2007 and 2009). But the really good news is that there's room in the cabinet for more trophies next season! Step forward, Burfield U15s. Burfield (that's Burton and Lichfield from Staffordshire) were also suffering problems with player availability and they kindly offered our two girls places in their squad for the tournament. So on a rather damp day in Harpenden, Sydney and Florrie put on Burfield shirts and took to the field with determination to do their best for Midlands side. Sometimes things that are driven by necessity can work out really well and, happily, that is what happened last Saturday. The coaches and girls from Burfield were friendly and welcoming and our girls had a great day. Of course, what made it even better for everybody is that Burfield played superbly to win the Plate competition. What a great result! I can't resist putting this one on the blog again - well done, Burfield! However, things didn't go to plan from the start - well, from before the start, really! Even before we set off to Harpenden we had lost 2 players - one to school work comittments and the other to a turned ankle during final training on Thursday which refused to get better in time. Nevertheless, undaunted, Letchworth Saracens girls set off on Saturday to discover that we were in a group with Burfield, Ellingham & Ringwood and Tyldesley. Those of you who have followed Letchworth's fortunes at the National 7s over the last 5 years will know that we always seem to have a tough group - not that there are any easy groups at the National 7s - and this year was certainly no exception as the group contained teams who would be the Plate winners and runners-up, a cup semifinalist and the eventual cup winners! Our first game was against Burfield. As has been traditional for Letchworth over the past 5 seasons, Letchworth Saracens duly got off to a slow start; something that you just cannot afford to do against a side as good as Burfield. Inevitably, Burfield opened the scoring and, following an injury to Claire which saw her sidelined for the rest of the game, cantered away to claim the opener 26-5. Second up were our old friends from Ellingham & Ringwood who had beaten us so narrowly in the group stages 12 months ago. Fortunately, Claire was recovered sufficiently to rejoin the team for this match. Letchworth Saracens put on a somewhat better display, though maybe the long wait between games on (another!) wet tournament day did not help their concentration, and they were eventually beaten 17-5 by the team who were to be crowned National 7s champions later that day. The game against Ellingham & Ringwood was a good result against such fine opponents and it was also notable because it was Nikki's 200th junior game. Letchworth girls rugby founder, John Birch, was on hand to present her with a commemorative shirt. With two group games lost, Letchworth Saracens were heading for the Plate competition and the result of the final group game against Tyldesley would determine whether they would finish the group in 3rd or 4th place and would, therefore, affect how difficult their Plate quarter-final game would be. After raising their game in the second match of the day, Letchworth Saracens did not really get going in the final group match. Tyldesley were a well-drilled side who took the game to Letchworth Saracens and dominated proceedings from start to finish to record a 24-0 victory. So at the end of the group stages, Letchworth Saracens found themselves in fourth place in the group and facing a Plate quarterfinal against Morpeth who were placed third in their group. Entering the knock-out phase, and a change to some dry Letchworth shirts, brought out the best in Letchworth Saracens who were determined not to exit the competition so early. A tight first half in which Claire broke away to score the only points was followed by a much more determined and assured performance in the second half resulting in a final scoreline of 26-0 in Letchworth Saracens favour. The Plate semifinal opponents turned out to be Reading who have several times been our undoing in previous touraments however, on this occasion, a tight game was resolved in Letchworth Saracen's favour by 12-5. So for the third time in four years, Letchworth girls found themselves contesting the Plate final. This time the opposition were Tyldesley who had convincingly beaten Letchworth Saracens in the group stages and, with a depleted squad and several girls carrying injuries, it was always going to be a difficult game for Letchworth Saracens to win. Although they put in a much better performance second time around, it turned out to be a similar result to the first game with Tyldesley running out deserved winners 19-0. In the end, they Letchworth Saracens girls can be proud to have done so well at this national event when starting with a depleted squad some of whom were carrying injuries. To have finished as medal-winning Plate runners-up - that is, 10th place overall in England - is a very significant achievement. Well done, girls!